Fat Cheeks are back with a special Sunday lunch at The Roxx Club in Notting Hill, to celebrate the Mexican festival Cinco de Mayo. Spicy times guaranteed! 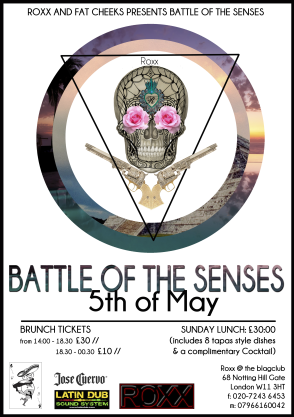 "FAT CHEEKS teams with Notting Hill’s hottest venue THE ROXX CLUB to celebrate Cinco de Mayo, “The Battle of the Senses”. A spicy Sunday feasting of delicious Mexican treats for your cheeks and Latin beats to get your bootie shakin’. Our chefs have been inspired by the freedom fighters of Mexico and will be presenting 8 unique culinary creations drawn from traditional ‘Cinco de Mayo’ traditions. Classics such as ceviche, sweet churros, tomales, mole, and eggs rancheros will be re- invented & served up with a few modern twists."